Industrial enterprises around the world are retooling their factories with advanced technologies to boost manufacturing flexibility and speed, achieving new levels of overall equipment effectiveness (OEE), supply chain responsiveness, and customer satisfaction in the process. This renaissance reflects very real pressures industry players face today. 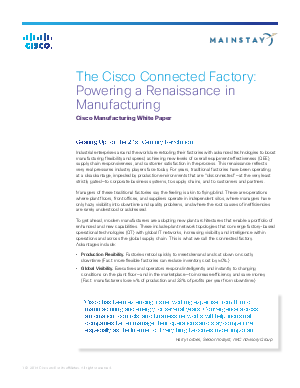 For years, traditional factories have been operating at a disadvantage, impeded by production environments that are “disconnected” — at the very least strictly gated — to corporate business systems, to supply chains, and to customers and partners.